This week was more of a dominant colour, the soft pink. Some traces of orange and red cause of some of the pictures but, mostly pink. 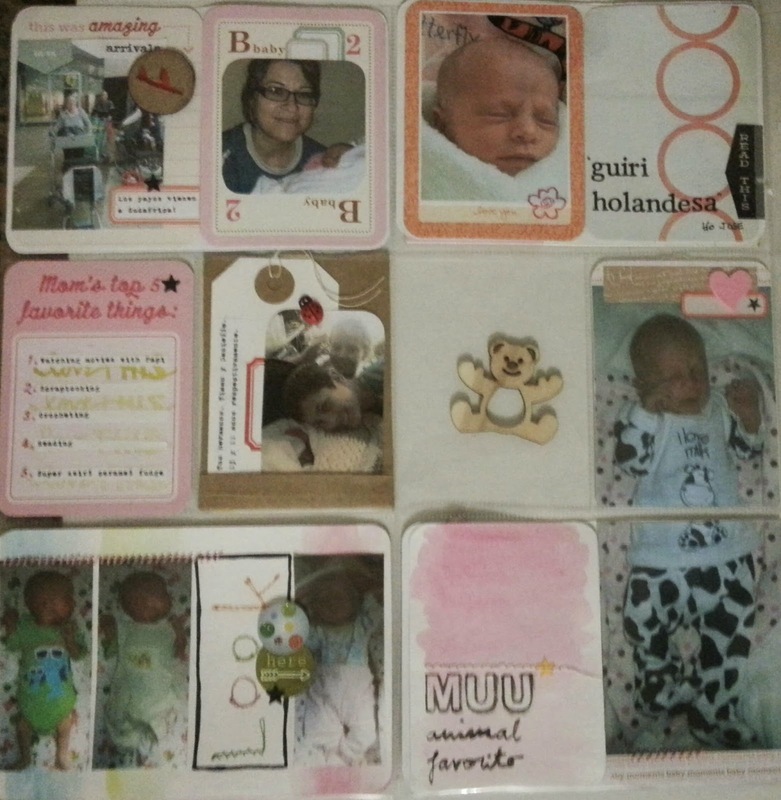 I am using here the Becky Higgins Baby for Her Edition as you can see on some of the journaling cards. I tried on some others waterdolours effects and leave one wood veneer shape alone in one pocket to play around with transparencies on both sides of the same pocket page. Stephanie showed me that if you were wondering. I do not remember exactly which challenge from the PL garden girls video was but she proposed volume on the spread, like the journaling she introduced into an envelope. Here, I made a replicate of a paper bag but 3x4 inches so I could slide in the flap my photo and my tab with journaling. I used the brown paper which came wrapping the Project Life box from Becky Higgins I purchased from Amazon to do the shape of the paper bag. 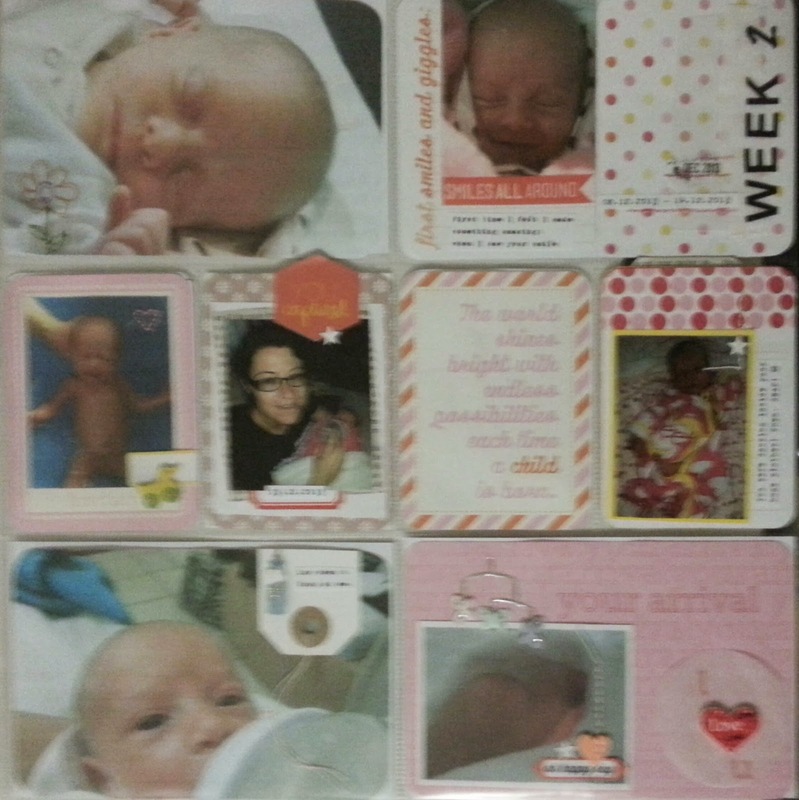 I glued this thin brown paper onto a 3x4 cardstock to give it strenght and use it as a base for my photo and tag. I love the picture of my sweetie in her cow suit so I decided to highlight it using 2 3x4 pockets size in vertical. A bit of the same I already explained plus stitches and rhinostones and stars here and there and voila', week 2 done.